If you tend to have high blood pressure, it makes good sense to monitor your blood pressure at home on a regular basis. If you've ever done this you'll know just how much your blood pressure varies from hour to hour. By checking it regularly during the day for a week or two rather than just when youvisit your doctor, you'll get a far better idea of your blood pressure health. The American Heart Association (AHA), American Society of Hypertension, and Preventive Cardiovascular Nurses Association urge people with high blood pressure, or at high risk for developing it, to become blood pressure do-it-yourselfers, and there are many good reasons to follow their advice. • Find your real blood pressure. The measurement your doctor or nurse takes may not give the full story. For some people it is an excellent approximation of their usual blood pressure but for others, it is not. Up to 20% of people diagnosed with high blood pressure will experience a spike in blood pressure brought on just by the stress of visiting a doctor. Still others may experience normal blood pressure in the doctor's office but high blood pressure everywhere else. • People who check their blood pressure at home tend to be more successful at keeping it under control. Actively participating in your own care generally gives better results than taking a hands-off, let-the-doctor-do-it approach. • You can't feel your blood pressure get better or worse, so measuring it at home offers vital information about whether your lifestyle changes and the medications you are taking are having their desired effects. 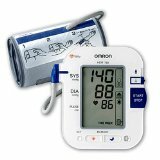 • Monitoring your blood pressure at home may mean fewer trips to the doctor. It could also mean taking fewer, or no, blood pressure medicines. Anyone with known or suspected hypertension or who have a family history of high blood pressure should consider home monitoring. If you are overweight, if you are a smoker, have type 2 diabetes or chronic kidney disease you are at high risk of developing high blood pressure and would be advised to monitor it regularly. New advances in technology have made devices for measuring blood pressure much more easy to use. Once upon a time you needed to go to a medical professional to have them read your blood pressure for you. Now it's a much more simple process and it is possible to hire or buy a blood pressure monitor to use in the comfort of your own home. Here is a very easy to use blood pressure monitor for you. Clicking on the link - monitor blood pressure at home - will take you to more information about blood pressure and what you can do to manage your blood pressure.